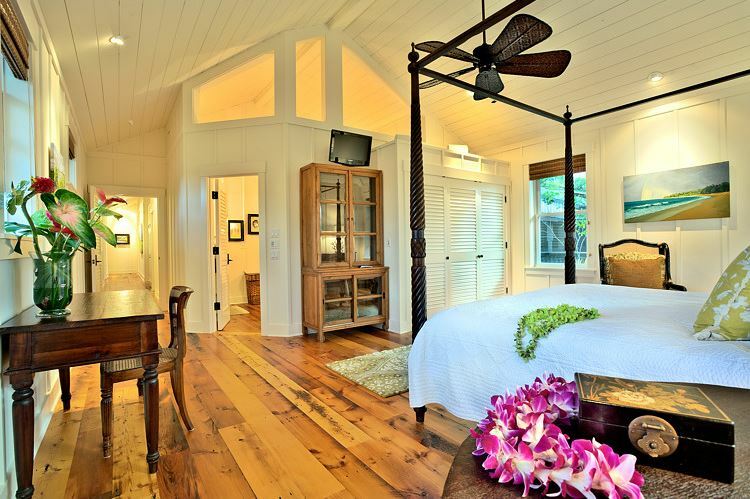 Hanalei Bay Hale – Luxury Vacation Homes, Inc.
Two Master Suites with California King beds, A/C, and private baths with double sinks. 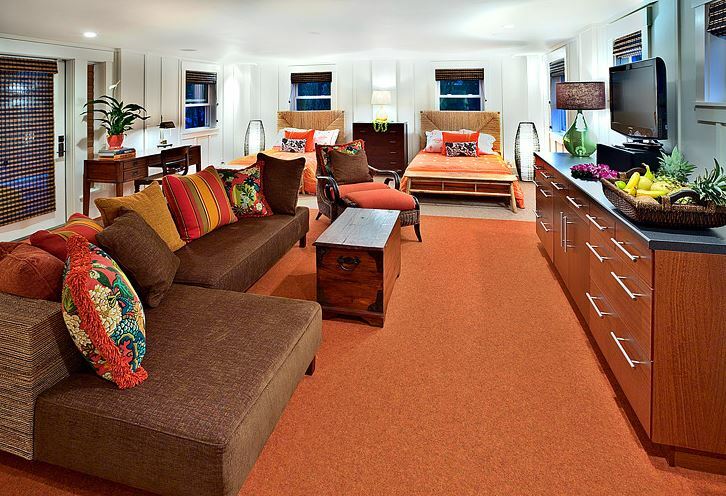 Bedroom Suite with two Full beds, living area, bathroom, and refrigerator. 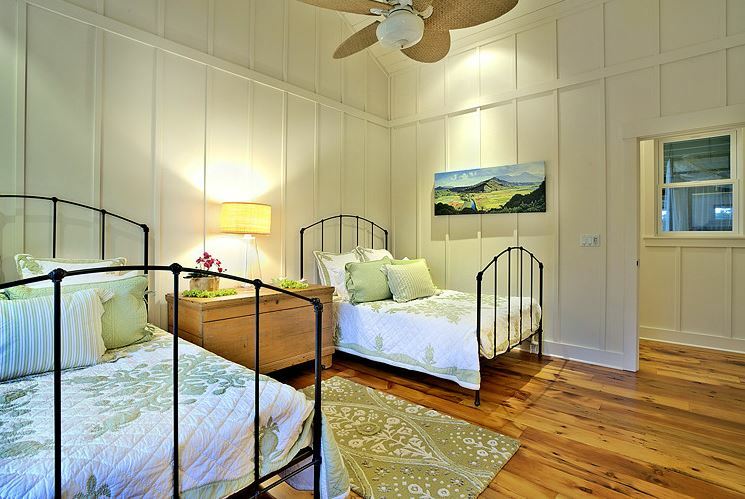 Guest Bedroom with two Full beds. 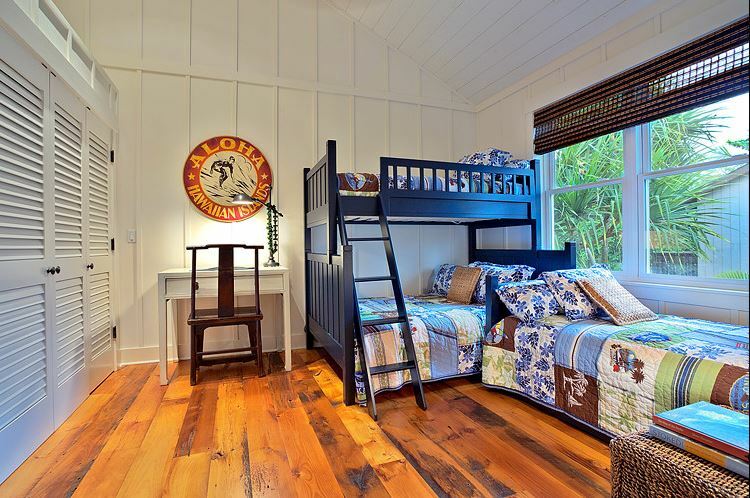 Kids Bunkroom which sleeps up to four, featuring a bunkbed with Full bottom bed and Twin trundle. Four and a half bathrooms. 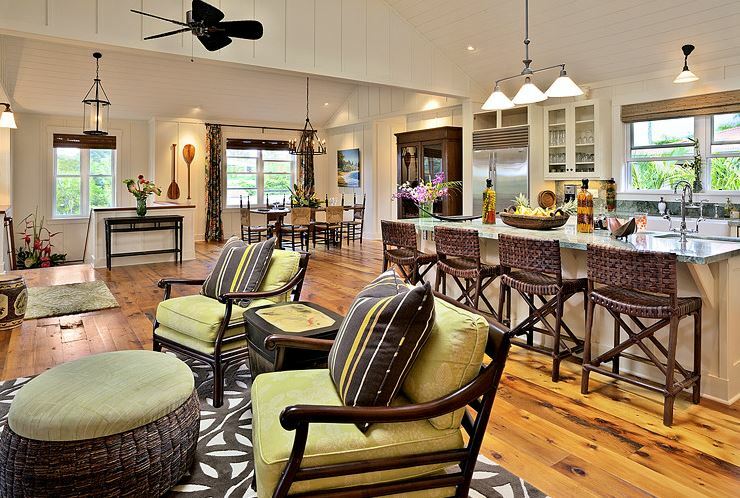 A wide-open floor plan with vaulted ceilings that is great for family or gracious entertaining. 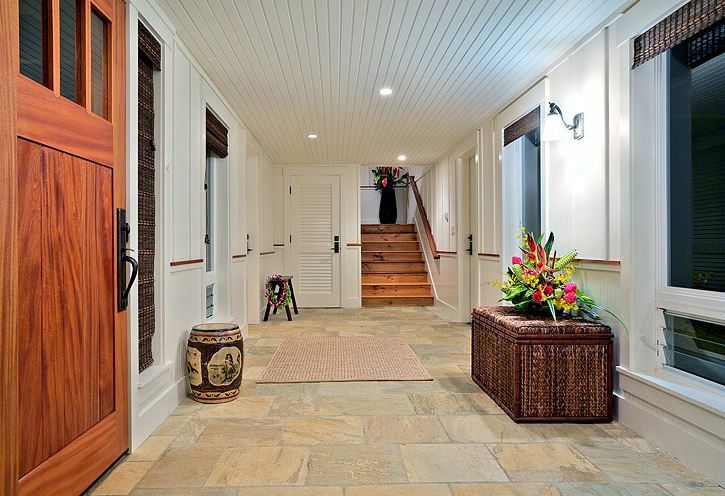 A Full House Distributed Audio System that will deliver your favorite music throughout the house. A fully-equipped gourmet kitchen with top-of-the-line appliances (Subzero, Viking) and granite countertops is perfect for intimate meals or large dinner parties. 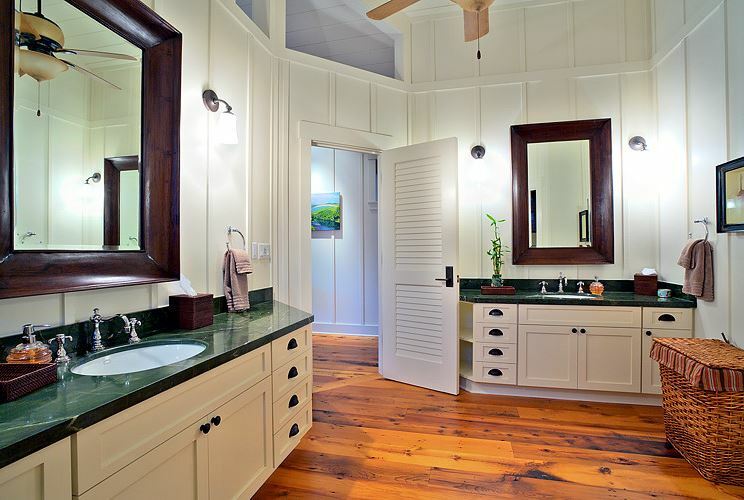 Two hundred year-old beautifully aged pine barnwood floors. 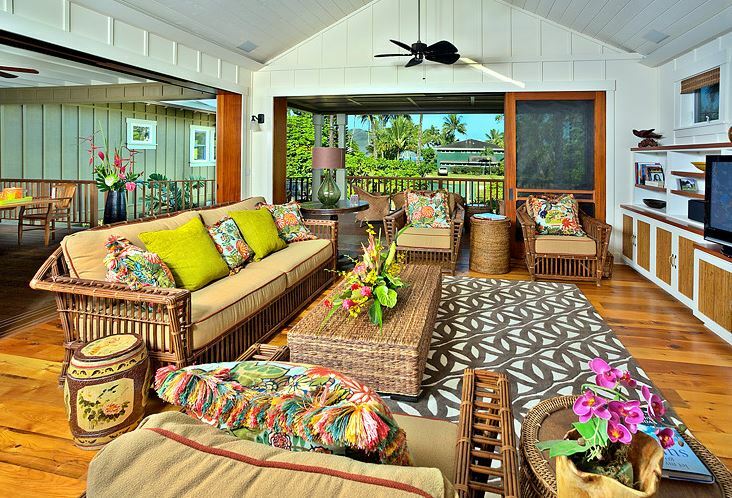 Oversized sliding doors to the lanai that open up fully so that you can capture the gentle tradewinds blowing in off the bay. They allow for seamless indoor/outdoor living. Quality Plasma TVs, DVD/CD players, Satellite TV, and iPod docking stations. Other amenities include: private outdoor shower, gas grill, Wireless High Speed Internet, two laundry rooms, top quality linens, beach chairs, umbrella, and oversized beach towels. 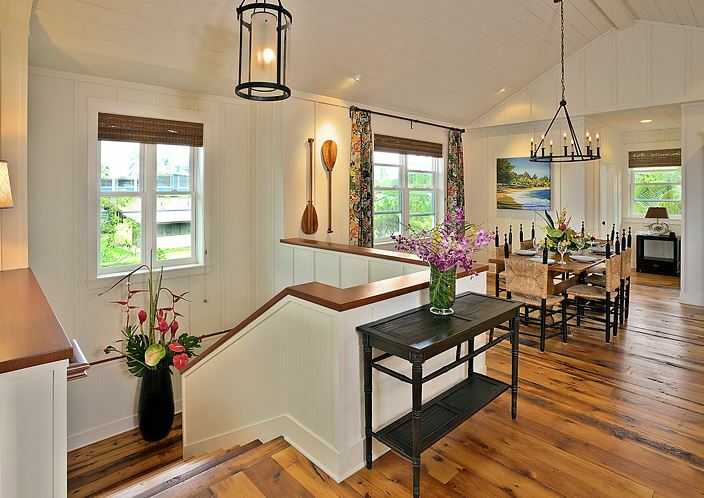 The home accommodates up to 12 guests. 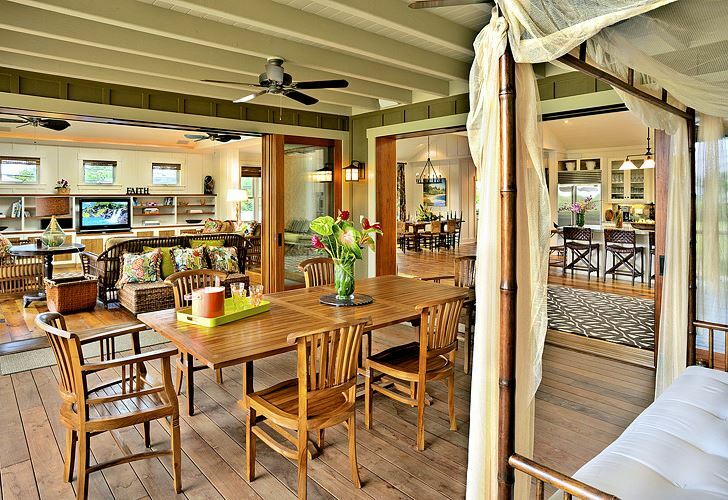 The heart of historic Hanalei Town is a two-block stroll from the house. 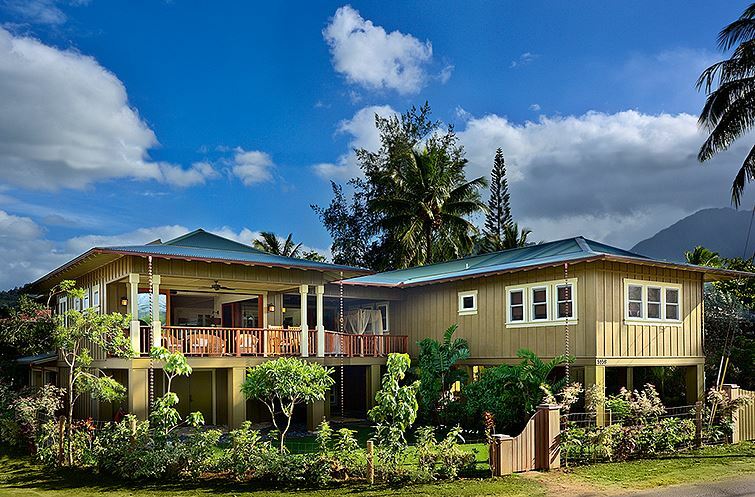 Hanalei has a variety of charming boutiques and services, including yoga and massage, as well as shops to rent kayaks, snorkel gear, or bikes. In Hanalei, you will find restaurants offering sushi, burgers, vegan dining, fresh fish, Pacific Rim, pizza, Brazilian, and tapas. Several restaurants have been featured in Food and Wine and Gourmet Magazine. Also, don’t miss the Hawaiian Shave Ice. 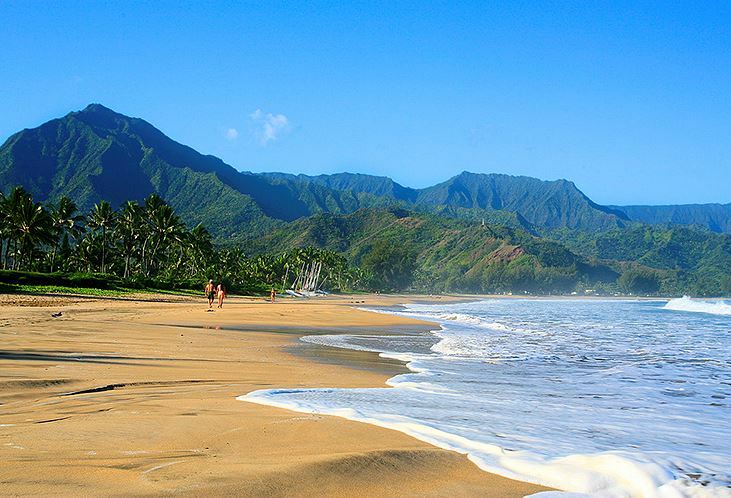 Hanalei Bay offers magnificent white sand beaches and views, and a variety of well-known swimming, surfing, boogie boarding, and body surfing locations. 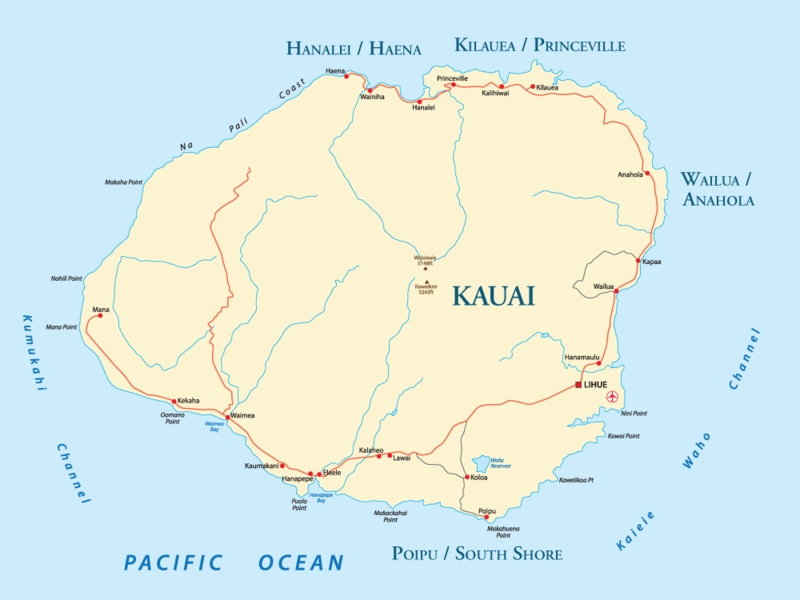 You are a short 2-minute beach walk to the Hanalei pier and Hanalei River where you can fish and kayak. There is seasonal world class surfing as well. 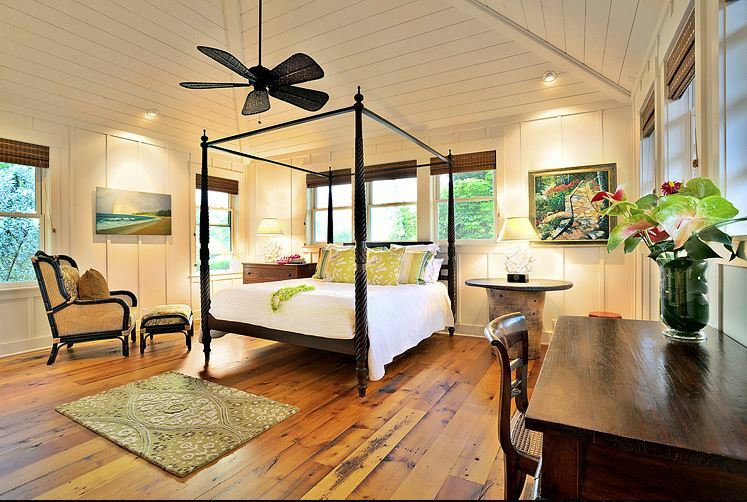 The Hanalei Bay Hale is a 10-minute drive to Tunnels, one of our finest seasonal snorkel and surf locations, and a few more minutes to “the end of the road” at Ke’e beach and the start of the breathtaking Kalalau Trail and the famed Napali coast. 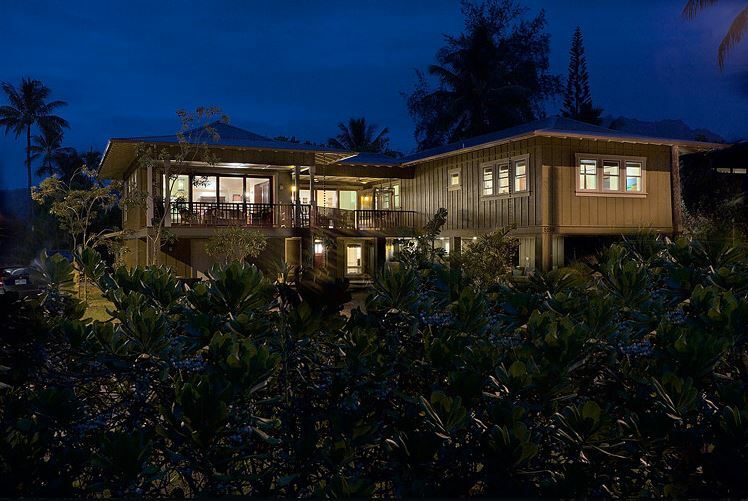 Princeville is 5 minutes from the house and offers golf, zip-lining tours, horseback riding, jungle waterfall kayak trips, shopping, and more. TVNC-5099.